Someone is hiding "Benny Bills". This is great! In a world full of lots of bad news, here's something awesome! 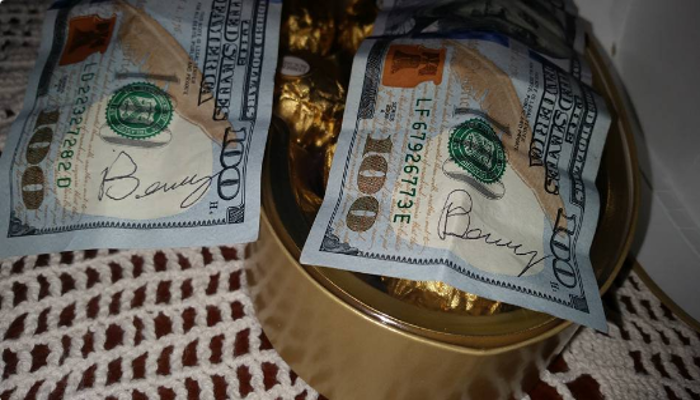 A mystery person in Oregon has spent the last few years leaving surprise $100 bills. They're in everything from diaper boxes to baby toys and more. The total is somewhere near $50,000! "And as time went on, a pattern emerged; people who found Benny bills found them at a time of real need. Brittany Medina, a 23-year-old mother of three, found one after opening a can of baby formula. It was right before Christmas, and the little boost was enough to help her buy presents. Other residents point out that the bills are sometimes found in waves, particularly when the news is dominated by awful stories. That hypothesis is strengthened by the fact that 86 bills were found last month, a record for Benny. That’s not the best part, Happily, the story doesn’t end with a bunch of lucky people happening on $100 and moving on with their lives. Benny’s generosity has inspired many of his recipients to pay it forward, with reports of those finding the money deciding to donate it instead of spending it on themselves. So far, 238 people have donated their money with animal rescue groups, food banks and schools being the most frequent beneficiaries of Benny’s bucks. $100 bills here and there may seem like a small thing in a world where so much is going wrong, but the ripple effect of one person’s generosity and the general good feelings his gifts generate probably impacts society more than anyone realizes."